When I was growing up, every Christmas was the same. On Christmas Eve, we would go to Mass: I would sing in the children's choir, the nativity pageant would be performed with many little shepherds and angels, and Santa would even make an appearance, handing out candy canes afterwards. This was followed by a take-out dinner. Some years it was a bucket of Kentucky Fried Chicken with biscuits, mashed potatoes, and coleslaw; other years it was Chinese from a restaurant down the block. Once dinner was over, we would wait around impatiently for Dad to be ready to hand out gifts for opening, all the while eating handfuls of M&M's and foil-wrapped Kisses. I love chocolate, and I'm well-aware of what good chocolate tastes like. Which means biting into a Hershey bar is no longer satisfying to the palate. It has a flat flavor, like something that's trying really hard to be chocolate but fails miserably. 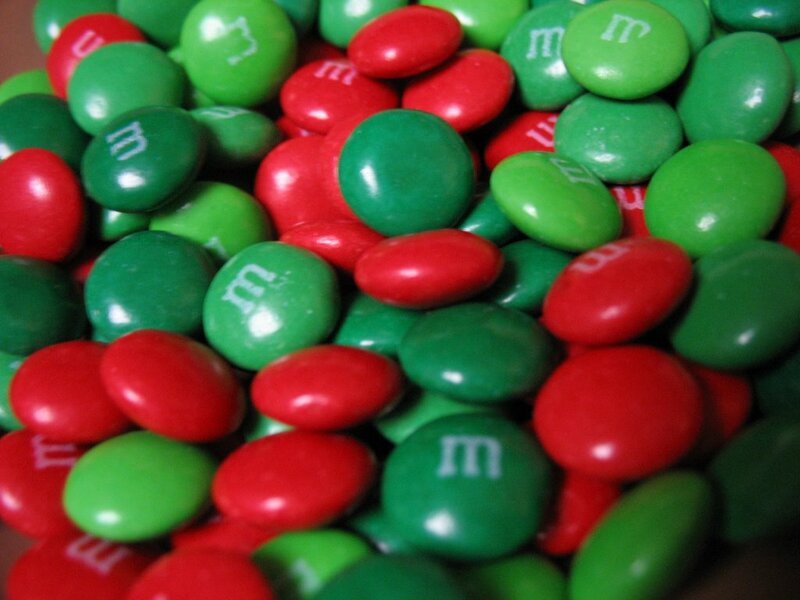 M&M's taste similarly — except when eaten at Christmas. Then they take on the flavor of nostalgia, of Christmases of long ago. I bought a bag of the red and green buttons and am eating them tonight, remembering a time when waiting for Christmas to come was almost unbearable and when I still believed in Santa Claus. What a nice post!! And I agree with you about nostalgia. Sometimes it has a flavor that we need to experience again! Here's to the New Year!!! What can you suggest to a guy with underdeveloped chocolate tastes? I generally enjoy M&Ms, don't care for Hershey Bars, and See's Candy is usually just fine for me. Oh, and I like milk chocolate - dark chocolate, to me, is like fine, very expensives coffees or liquers - good, but not something I enjoy as my "everyday".